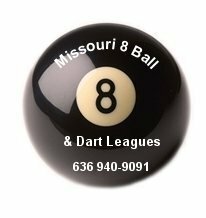 Missouri 8 Ball ladies league sign up sheet. Call Rusty at 636-940-9091 to see if the ladies leagues are available this session. Fill in the blanks or select the appropriate button below. Do not hit the [Return] key before the form is complete. The [Tab] key will move you to the next field. After reviewing. click the "Submit" button on the bottom of this form.